I'm loving this latest project. It's right up my street. Did you manage to fill most of the foam with tools from the standard tool wrap? Obviously not the compressor? Have you got the genuine wheel changing gloves and plastic bag for the dirty wheel though? I'm missing the Porsche gloves, wheel bag and pressure gauge - otherwise I'm factory correct, largely from the tool wrap. I'll add some standard work gloves, being a sucker for OEM I'll find the correct pressure gauge. I've also got two towing eyes in there so I can run one front and rear for track days to stop the car being dragged out of a gravel trap by an exhaust manifold if the worst happens. I'm wondering about putting some tie-down eyes on the corners of the new floor so I can use a small luggage net to stop smaller items flying around, maybe for V2. So I'll wait until they've got some grey before sticking it down I think. 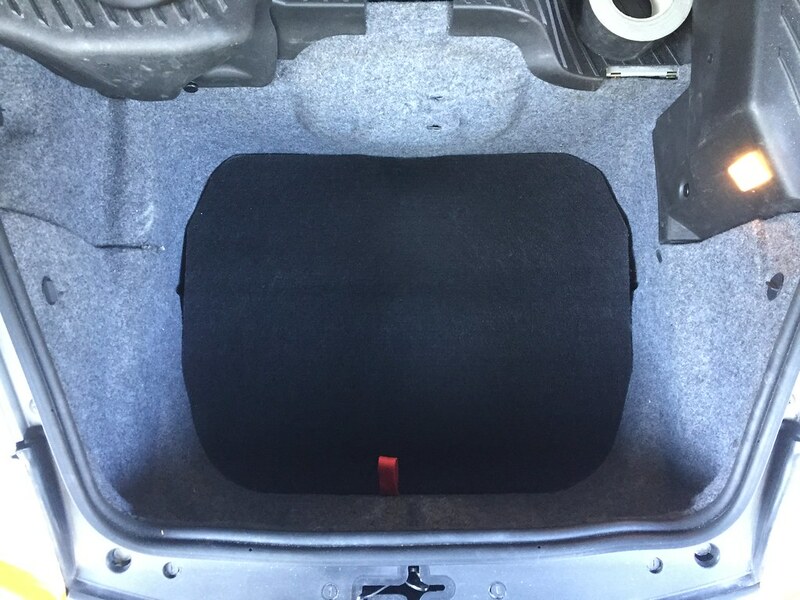 Any suggestions for where to get thin carpet that matches the Porsche luggage area liner please let me know? Very nice. I like your attention to detail. Not sure if you could cut this up to make a big enough piece to cover it ..
Or just search ebay for 996 front lugage carpet. I have searched, and purchased black luggage compartment carpet- so it will all match. Boom. Race Techniques will be specifying what design changes are required for mechanical tappets and higher lift. 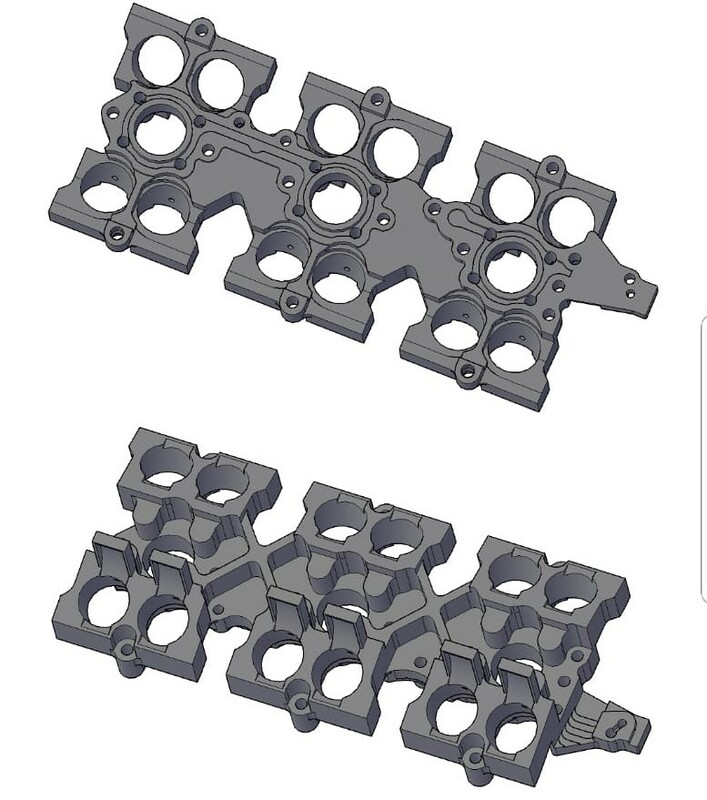 We believe that making these from much stronger material will resolve the hydraulic fracture issue, so no additional scavenge pump on the head. I didn’t get my shortblock from Porsche, I’m buying it from Hartech, costs are quite fluid at the moment as I don’t knowing much of it I’m going to use- crank/pistons and rods can be resold to recoup some cash for e.g. I’ll likely use 300M rods with Hartech pistons, and an EN40B crankshaft. Th heads started life as stock 3.4 ones, the goal is to both remove the flaws and boost performance. We’d like to do better than the 96 bhp per litre that the X51 kit developed. We’ve kicked the dry sump idea around, not sure at this point. Would I like too? Yes. Do we need too? Unknown. Do I have an infinite supply of money? Sadly not. Does the scavenge pump in addition to helping with the fracture issue, also assist in getting the oil back to the sump so that its available for pick up, thus elevating a degree of oil starvation issues? We believe that we have solved the first one (pending results of in-production testing), the second is still something that is under investigation. We don't plan to use the head mounted scavenge on our engines, at this point. 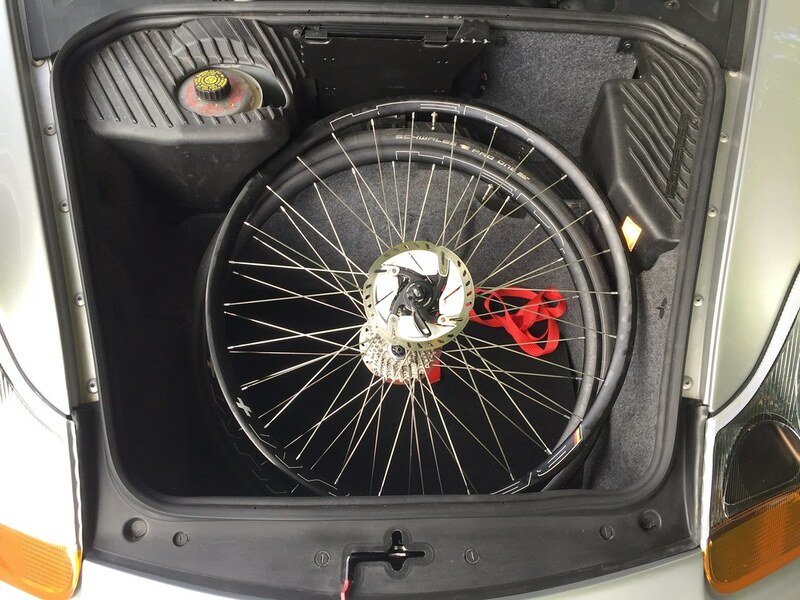 Apart from 'because I can', what is the thinking in removing the spare wheel and then filling it with foam. 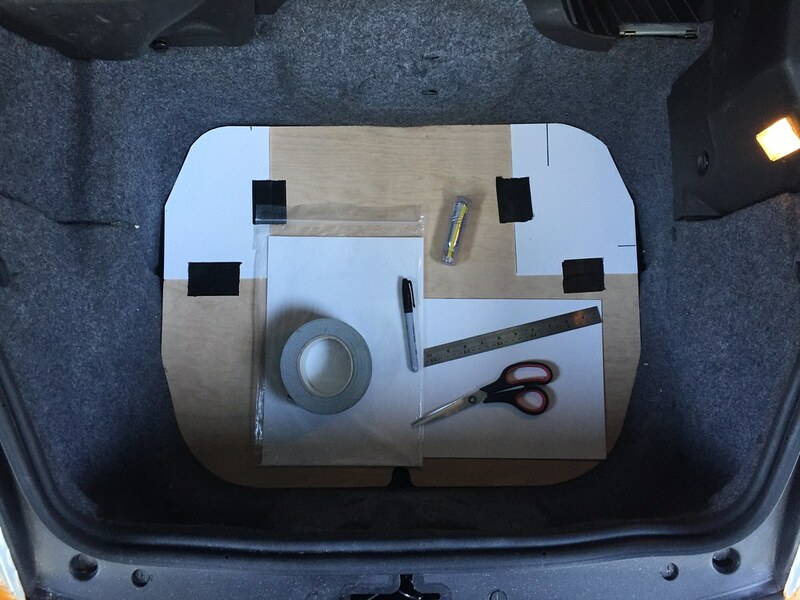 Does the extra space allow for two airline size suitcases in the frunk? Looks neat though, so I might be tempted. However I am more likely just to chuck the spare wheel out. Or even more likely just to do nothing. I just wanted more room, but with the ability to get home if the worst happened and every break down service shut down at the same time. 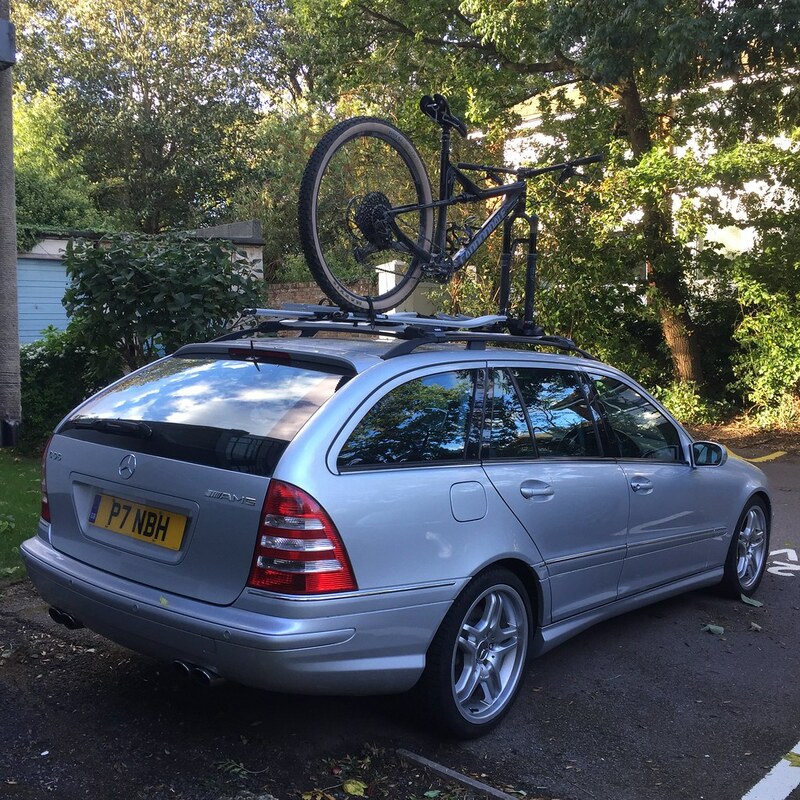 It's a more usefully shaped space without the tyre in there - try getting a couple of bike wheels in when the spare wheel is in place, or suitcases etc. 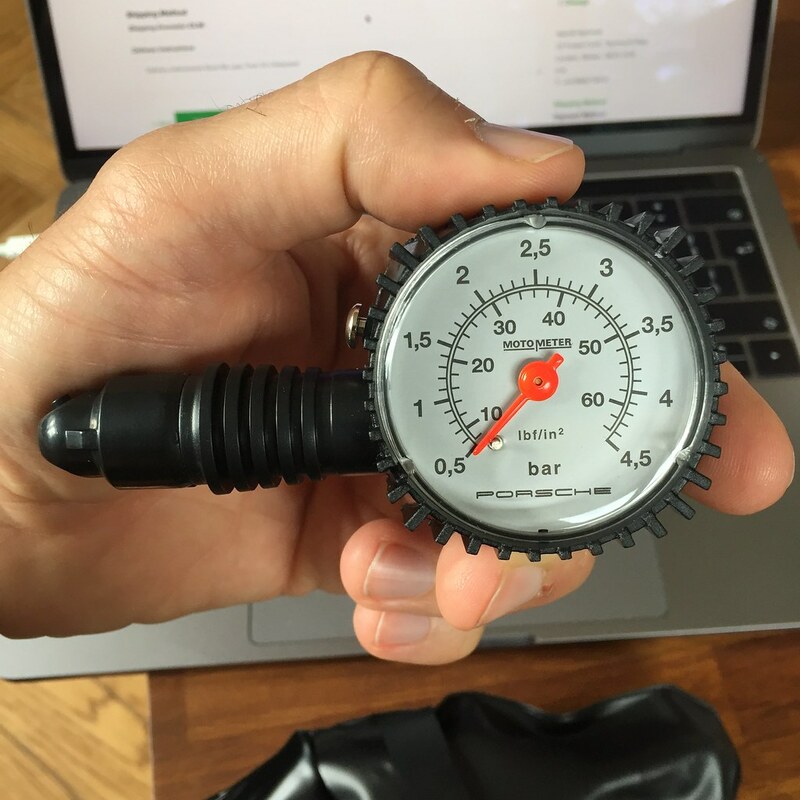 I bought the foam holder from OPC, decanted my existing tool kit into it, bought a 987/997 puncture kit for the sealant and pump (way cheaper than buying just the pump on it's own, entertainingly), put that in, then the pressure gauge I ordered from an online Porsche parts place. 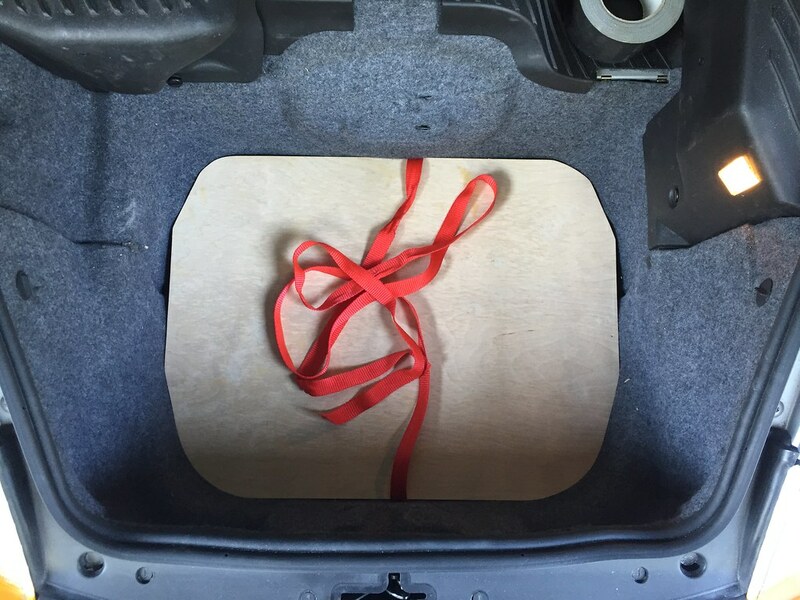 I imagine you can just order the lot from Porsche, plus the correct false-floor, but I object to paying £350 for a bit of ply with carpet stuck to it. Which I'll buzz out of 6mm ply and then cover in thin carpet over the next few days. That is pretty cool - you could make a few $$$ out of that template if you made a few and sold them on ebay. You can buy that foam filler as well already cut into squares and you just remove the pieces you need to make the correct shapes. I think maplin used to sell it so there must be other places that do. 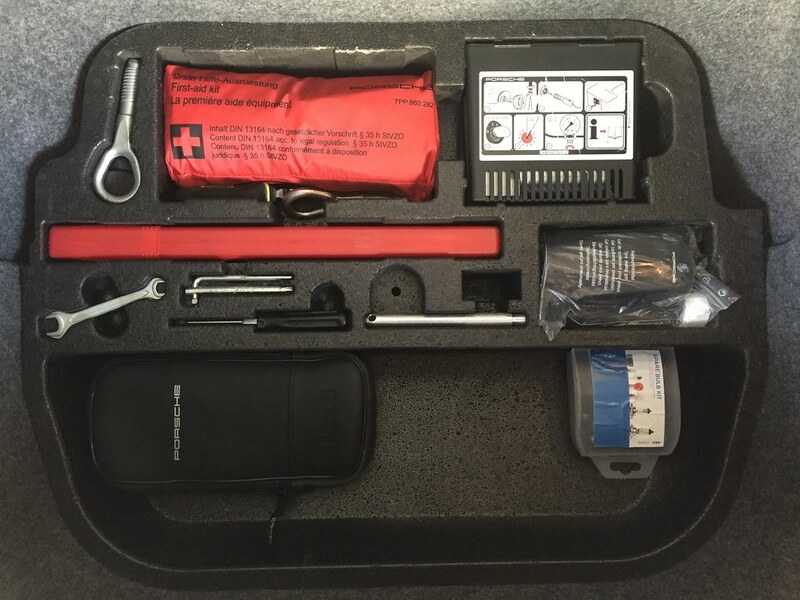 It is designed for use in flight cases etc for transporting tools and instruments. Dropped the car off with the painter again this morning- they are a nice bunch. Getting their partner firm to trim my Tequipment handbrake (all blame for this rests with you know who), but the Function First shifter didn’t turn up in time to have a matching boot made, I'll run it down again for that when it turns up. Interestingly the roof needs some work- which given that the car went to a roof specialist on a low loader last time they had it I am surprised by, as I’d have thought they would have fixed everything. Be interesting to see what I get charged for when I pick it up. I was in New York a few weeks ago for a work event - flew in on Tuesday, back home on Sunday. New York is the closest part of the US to the UK, but if you normally get up at 6.30 and like to be in bed by 10 or so the time zone is still something of a dislocation. I was waking up at 1.30-2am, then finding ways to kill time before going out for a run around the waterfront just before dawn. Long story short - I ended up getting a couple of private plates, the devil makes work for idle hands! They're both 5 digit plates, an arbitrary letter/number and then my initials. This does mean that I can, whilst maintaining legal spacing, run a 17" front plate, which means it fits precisely on the front plinth. I think this looks neater, as the overhang of a standard plate has always looked a little awkward to me. Therefore the next challenge was to get a 17" plate. Mainly from Pistonheads I'd seen recommendations for Fancy Plates, an outfit based in Ireland - so I emailed them. I got no response, so I called them and left a message. No response to that either, but it was only a few quid (£56) so I placed the order and then used their "contact us" form, sent them another email and left them another message, asking for the front plate of the P4 set to be 17". I got no response to any of these messages, and indeed when the plates turned up they had totally ignored me. Handy. But I now had two plates for the Porsche that didn't really work for what I wanted. I did a bit of searching this time and found a different company - Plates for Cars. I emailed them and they replied to me - a good sign. We talked through what I wanted (100% legal spacing, font, EU/GB badge, 17" width) and they agreed to cut the plate to my requirements using their new laser (I didn't ask if this was shark-mounted). It's been a pleasure dealing with them so far - hopefully when the plates arrive I can remove the "so far", that should be the next couple of days. One thing that was reassuring was that during the conversation I held with them they mentioned making a plate for a chap with a GT2 who also had a four digit plate - my little 996 was (in a tenuous way!) in good company. Lesson learned here - if a company won't answer your inquiry then don't give them your money, and working with companies who are actually interested in their customers seems to lead to better outcomes. I've been guilty in the past, of what you describe above. Persevering with a crap company for some totally unknown reason, despite getting a bad gut feeling about them from the start. I've learnt now mind. These days if someone doesn't reply when I'm offering them money then that's that, because if they don't bother their arse when you're giving them money, imagine how uninterested they'll be if you have an issue, after they've had your money. That goes for all companies and tradesmen, whether it be for my car or house. Have you gone for an extended Function First shifter? Thanks! Glad to hear that people find it interesting. Yes I have - extended shaft (obligatory fnar), yellow inlay for the shift pattern. I'll get the shift boot made in alcantara that matches the the handbrake and steering wheel when it arrives.